Silky Windgrass (Apera spica-venti) is a monocot weed in the Poaceae family. In Poland this weed first evolved resistance to Group A/1 herbicides in 2010 and infests Winter wheat. 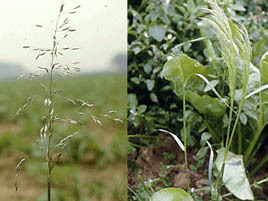 Group A/1 herbicides are known as ACCase inhibitors (Inhibition of acetyl CoA carboxylase (ACCase)). Research has shown that these particular biotypes are resistant to fenoxaprop-P-ethyl, and pinoxaden and they may be cross-resistant to other Group A/1 herbicides. The seeds of Wind Bentgras (Apera spica-venti) become from difference sites from North-East part of Polnad and the seeds were collected from field were ACCase inhibitors during last few years was used for control and farmer got problem to control this grass. During years 2008-20010 15 samples were collected. Four replication greenhouse trials comparing with known susceptible Wind Bentgrass with collected samples was done. For testing the samples two types of experiments were used. At first experiment in one dose of three herbicides with difference mode of action were chosen: chlorsulfuron, fenoxaprop-P-ethyl and isoproturon (IPU). Two and 4 weeks after application visual assessment were done. Plants that did not show any symptoms of wilting or drying within 4 weeks after treatment were evaluated as resistant individuals. With 5sellected populations (biotypes) second type of experiments were done. At this trials fenoxaprop-P-ethyl and pinoxaden each in 7 deference dose were used, (low and high dose). And 4 weeks after treatment, the plants were cut at the soil surface and their fresh weight was determined. The obtained results were expressed to percent of control to untreated. The susceptible biotype (S) as standard was used. The results was used for calculation to define of effecting dose for calculation the ratio and ED50 for resistance and susceptible population, and for resistance index calculation. For each treatment four pot were used as four replication. Statistical analysis of date from greenhouse experiments was performed. At three sites one year field trials with isoproturon, fenoxaprop-P-ethyl and pinoxaden used with 4 dose were determined . Adamczewski K., Matysiak K. 2009. Odporne biotypy miot³y zbo¿owej (Apera spica venti L.) na inhibitory karboksylazy acetyloCoA (ACCase) (Silky Bentgrass (Apera spica-venti L.) resistant biotypes to ACCase inhibitror herbicides). Progress in Plant Protection/Postepy w Ochronie Roslin Vol. 50 (1): 291-296. (in Polish, summery in English). Adamczewski K., Kierzek, R. 2010. Resistance of silky bentgrass (Apera spica-venti (l.) Beauv.) to ACCase inhibitor herbicides in Poland. Proceedings of 15th Symposium EWRS. Kaposovar-Wêgry 2010: 53. Field, Greenhouse, and Laboratory trials comparing a known susceptible Silky Windgrass biotype with this Silky Windgrass biotype have been used to confirm resistance. For further information on the tests conducted please contact the local weed scientists that provided this information. There is no record of differences in fitness or competitiveness of these resistant biotypes when compared to that of normal susceptible biotypes. If you have any information pertaining to the fitness of Group A/1 resistant Silky Windgrass from Poland please update the database.